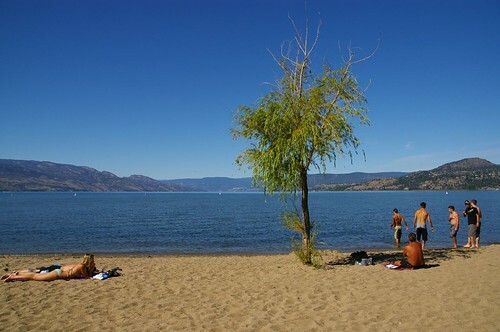 Midweek saw us travelling from Kelowna to the town of Penticton situated at the Southern end of the Okanagan Lake. Between the two lie the attractively named Peachland and Summerland. Leaving the city of Kelowna the new floating bridge, constructed recently lay before us. The William R. Bennett bridge was under consideration long before being given the green light so to speak. For many of those years too, the original floating bridge was deemed to be an inadequate crossing of Okanagan Lake with regular traffic jams. New bridge built alongside the original, the latter is now is now in an advanced state of demolition. Immediately over the bridge and things are changing fast, politically at least. ‘The formerly proudly named Westbank is now known as ‘Westside’. An ignominious name perhaps for the proud and historic roots of Westbank. Fifty-three years ago the might of the Soviet Union team were the world new super-power in ice hockey winning the World Championships. Always previously known as ‘Canada’s game’ the on-ice game was changing fast as the Soviets had defeated the East York Lyndhursts of Ontario who were representing Canada. This ignominious defeat by seven goals to two sent shock waves reverberating through Canada and the world of hockey. Previous to this, mighty Canada had always sent a top amateur team to contest the competition against other nations and now the call went out for someone to restore Canada’s pride. The team selected for the task were The Penticton Vees. 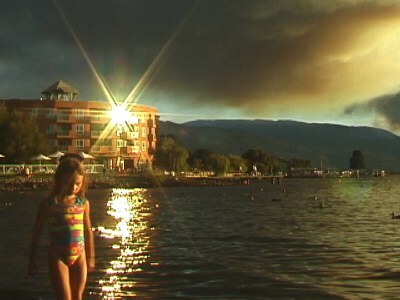 Penticton is but a small (and very pleasant) town at the southern end of Okanagan Lake. Tourists visit for the fine beach and winter skiing. Although always being fond of it’s hockey, it’s probably an unlikely place to search for a team to beat the might of the Soviet Union. Nevertheless, the Penticton Vees were the chosen to claim back the title, the team and Canada’s reputation being seriously at stake. Another restaurant review to offer for the visitor to the Okanagan. As previously stated, there really are some wonderful eating places to choose from in the city but Wild Apple is surely amongst the best at the ‘high end’ of the price range.For the UK visitor, that term will not cause too much dismay. Canadian prices being what they are, this attractive grill at Manteo Resort will not cause great consternation when ordering the bill. On the night, at around 7.30pm Thursday, we found it a little difficult to park and finally had to park on Lakeshore a short walk down the road. On reaching Manteo, the foyer of the resort is very impressive and relaxed. Though plush and well-appointed, a resident bedecked in towelled robe and sandals wandered unconcerned across the polished and spacious reception area as we made our way to the two young female receptionists stood behind a lecturn. In a quiet alcove a businesswoman sat in a huge leather armchair tapping on a laptop. THE OKANAGAN – WHAT A PLACE ! Just moved to THE SUNNY OKANAGAN. NOW THIS IS THE PLACE TO LIVE … Beautiful sunny days and warm balmy evenings. What a place! It is beautiful. I’ve finally found my home. I love it here. The legendary Loch Ness Monster which supposedly resides in the deep waters of the Great Glen in Northern Scotland is a well known figure whether believed or not. How many though would know of ‘Nessie’s’ reputed cousin, Ogopogo, the storied monster of Okanagan Lake in British Columbia’s interior? There’s a fine tale I’ve always been fond of that the palindromically named Ogopogo is actually Nessie’s cousin, and that there exists a tunnel through to the dark, dank waters of Loch Ness from Okanagan Lake. I like the notion of this. The earliest sighting documented of Ogopogo was by some of the first European settlers in the area back in 1927. A large group of people were reported as seeing the monster a little while afterwards and the story was given serious credence in the newspapers of the time. Some sighting have been accredited to being otters, logs and beavers. When one considers the last example it seems a bit of a stretch as a fully grown beaver can reach only as much as four feet whilst sighting describe a creature of fifteen feet and more. Yet another opinion believes that Ogopogo is actually a Sea Sturgeon. A nice tale is that the monster lived in a cave in an island on Okanagan Lake. Unfortunately the view of the cave’s entrance has now been obscured by a housing development! Local native people call the monster ‘Naitaka’ which translates as ‘sacred creature of the water’. It was non-aboriginals in Vernon, BC that renamed the monster ‘Ogopogo’. There are many legends and tales of the monster and many of them are of Native origin. One legend states that Ogopogo was a man possessed by demons who had murdered a well-respected local man by the name of ‘Old Kan-He-Kan’. The name evolved into ‘Okanagan’. The Native gods transformed the murderer into a lake serpent so that he would never be released from the remorse of his evil deeds. Curiously, some sightings of the monster are described as ‘log’s coming to life’ And swimming away. One such spot in Peachland down the lake from Kelowna described whatever she had seen as coming to life and swimming against the tide. In earlier times Natives from Westback on the opposite side of the lake would row over to Kelowna for supplies. On one occasion not one but three Ogopogos were said to have tried to tip their row boat over! The frightened First Nation people even reported that when they found the courage to take to the water again Ogopogo would always be there waiting for them! Early rock painting by Natives that depict the sea serpent have been reported by early settlers in the area. They often showed a fish-like animal able to stand upright. Other later sightings tell of a humped creature with a head similar to a sheep. Yet more talk of a snake-like creature. A famous spotting was the story of one Henry Murdoch who was practicing for a long-distance swim on the lake back in the early 1930s’. Murdoch had a pilot boat accompanying him twenty feet in front. At one point his friend John Ackland looked up to see the swimmer disappeared and began frantically searching the water for him in the eight-foot deep water. With no success he rowed to shore to alert the police but after two days searching and dragging the lake Murdoch’s body was mysteriously never found. Henry a former lifeguard and the Okanagan area’s best swimmer arguably was never seen again, in spite of the waters being extremely clear, shallow and without a current. So who knows the truth about Ogopogo? Sightings continue in modern day. Some talk of the monster being descended from the plesiosaur others have diverse opinions as to its origin, if any. From a personal viewpoint I’ve always treated the story with a large pinch of salt; much as some locals appear to if the jokey Nessie-like statue of Ogopogo in the Lake Shore area is to believed. Carrying out a little research into the legend alters my pre-formed opinion though. Some sightings are perhaps easier to dismiss than others but others seem very realistic and vivid alternatively. The Native rock paintings and the way they depicted aboriginal life in that era are also very thought-provoking. I’ll pass on a ‘don’t know’ verdict on Ogopogo – just as I did The Loch Ness Monster. Whatever your beliefs, the legend of Ogopogo with its many tales and fables is one to relish and one that Kelowna and the Okanagan owns personally. One of the visits I was most looking forward to during my current stay in British Columbia was an excursion to see The Kettle Valley Trail which has points just 18km south-east of Kelowna. 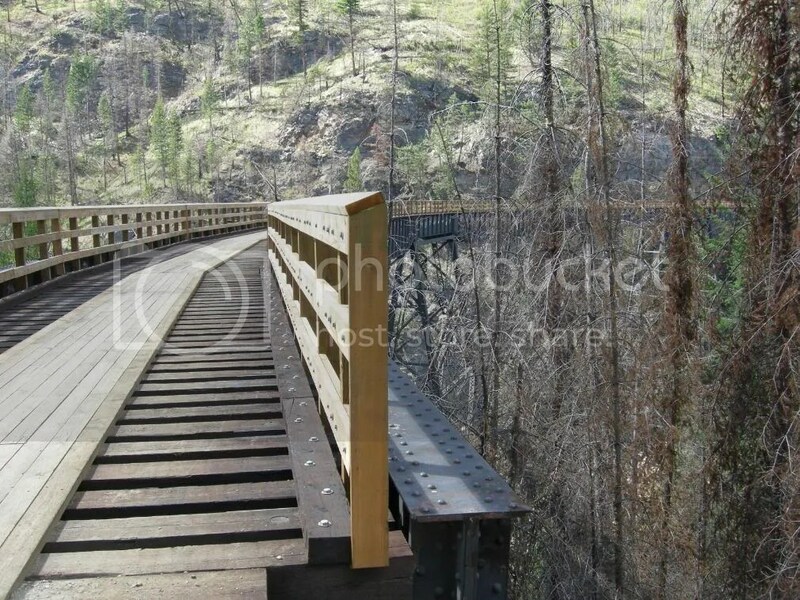 Some five years ago the original mountainside trestles which the Kettle Valley Railway had historically travelled across were horribly destroyed during the Great Okanagan Mountain Park Fire which ravaged the area and changed the landscape for ever. Our trip was to view and walk arguably the most spectacular part of the old route, The Myra Canyon with its huge wooden trestles newly restored, promised a unique experience up in the foothills of the Purcell Mountains.